Learn how to invite new users to your TrackingTime account. To invite people to join your TrackingTime team, please follow the steps described below. Please note that only account administrators are allowed to invite new users. Click on 'Invite teammates' on the upper right corner of the screen. Enter the email addresses of the persons you'd like to invite to your account. Use the enter key to enter more than one email address. 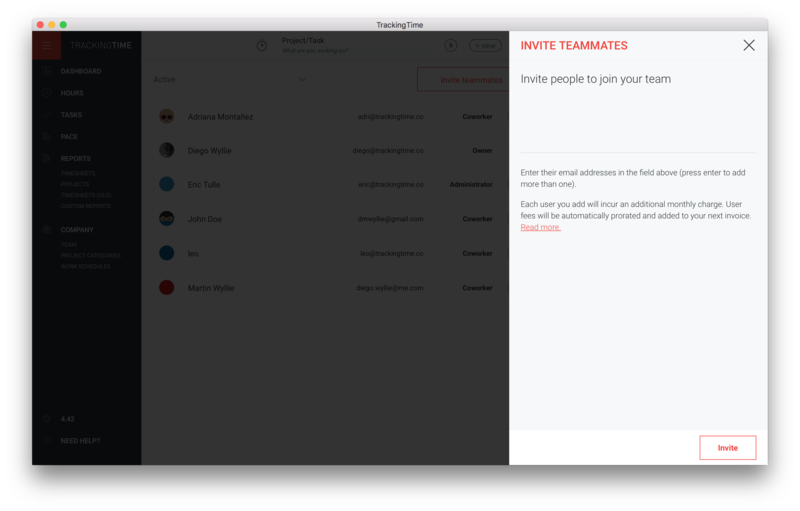 Customize the user roles for each of the invitees. We'll send email invites to the entered email addresses with further instructions for the new users on how to setup their accounts. Specifically, they’ll be required to click on the invite link they received per email, enter their user name and create a password. 💡Tip: You don’t need to wait for new users to set up their accounts. Once you’ve sent out the invites you can already start assigning projects and tasks to them. New users will be set as project managers by default. This means that they'll have access to all account projects, tasks and time entries. Also, they'll be able to add new projects and tasks and to create their own reports. If you'd like to limit access for new users, you can change their user roles to coworker and customize their permissions according to your needs. Sometimes, email invites can be marked as spam by a user’s email program. If your coworkers are having troubles receiving their email invites, you can use the ‘Resend Invite’ button to try sending the email again.